Synchronisation of the multiclock to a DAW relies on a sample accurate audio clock stream, which in consequence guarantees absolutely tight clock signals with ±1 sample of jitter. No drifting involved, everything on the grid. VST, AU and AAX plugins for all major DAWs are provided, or you create your own sync loop with our sample. You can configure the modular clock output mode in every possible way: choose the polarities of the signals, select the start or reset behavior for each channel individually and set clock dividers. There is also an analogue LFO available with various waveforms and optional frequency quantization to connect to the Eurorack world. 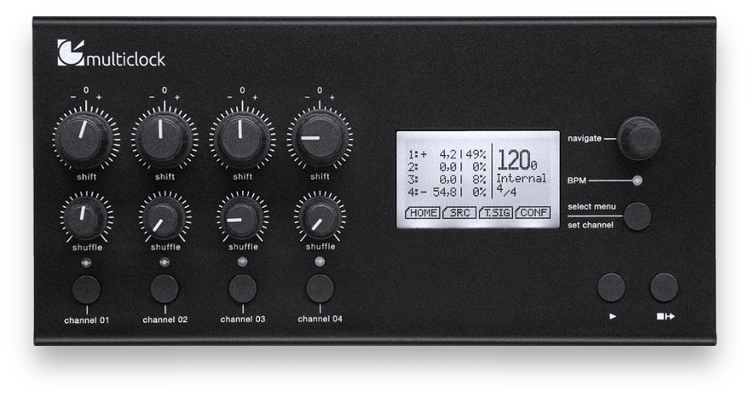 Sync all your drummachines, grooveboxes, sequencers, arpeggiators and effects with a stable MIDI Clock or DIN sync/sync24 signal. But also your tape machine can be back in the game: simply record a 24ppq loop of our sync sample to one track, connect the tape machine to the multiclock Audio In and be in sync! With the app The Metronome from our friends at Soundbrenner, you can easily integrate the multiclock and all its attached slaves into your Ableton Link environment. This enables you to sync Android and iOS apps as well as computer software in the Link cosmos with your other musical instruments. Learn more.